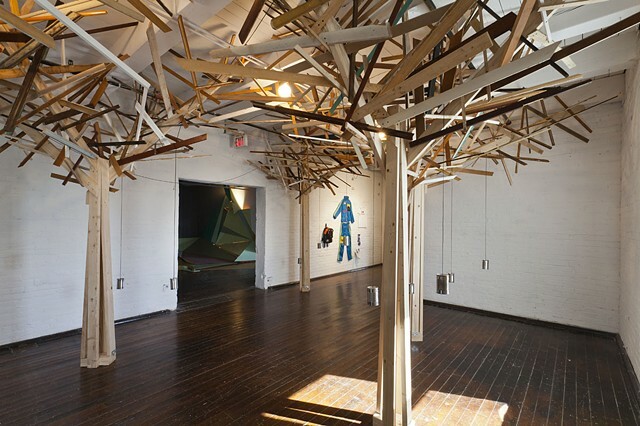 Wood for the trees was collected from my Hamtramck alleyway in Detroit. It is mostly reclaimed wood from construction to the old houses. They aren't tearing down to demolish, they are fixing up. I thought the trees showed new growth can come from the refuse of a place. From the gutter, and alley, much can be reborn. The old wood is the town, the new 2 x 4 trunks are the new immigrants, Bangladeshi and Yemeni and Eastern European and artists, like me.